There’s no denying the popularity of the Silver Canadian Maple Leaf coin. 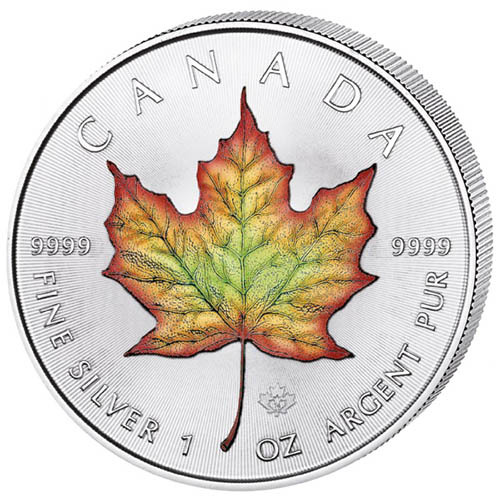 The official silver bullion coin from the Royal Canadian Mint, the Silver Maple Leaf was the first-ever .9999 fine silver bullion coin in the world and shares the same stunning design of the sugar maple leaf as its gold, platinum, and palladium counterparts. There are also unique options available out there. Today, 2019 1 oz Colorized Silver Canadian Maple Leaf Coins are available to you online at Silver.com. Available to ship inside of protective plastic capsules! 32nd release of Silver Canadian Maple Leaf coins! Colorized version of the popular silver bullion coin! The face value of $5 (CAD) is fully backed by the Canadian government. 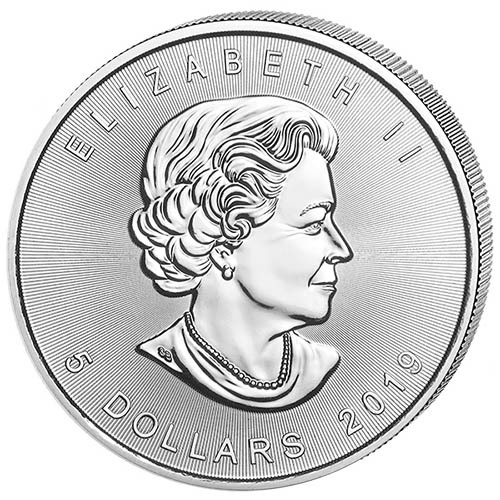 On the obverse is a portrait of Queen Elizabeth II. The reverse includes a colorized depiction of the sugar maple leaf. Silver Canadian Maple Leaf coins are the second best-selling coins in the world behind the Silver American Eagle. During the height of the Great Recession, the Silver Maple Leaf’s annual sales figures surged into the 10s and 20s of millions each year. While it remains available only as a bullion coin, that doesn’t mean alternative versions of the investment-grade coin aren’t available. All of the 2019 1 oz Colorized Silver Canadian Maple Leaf Coins in this listing come to you in Brilliant Uncirculated condition. The coins are housed inside of individual protective capsules and feature beautiful colorization on the reverse field. The addition of colorization includes the use of colorized lacquer applied intricately to certain design elements for a life-like appearance. On the reverse of 2019 Colorized Silver Canadian Maple Leaf Coins is the image of the sugar maple leaf created by Walter Ott. The colorized sugar maple leaf featured here captures the leaf as you might find it during the fall months in North America. While the heart of the leaf near the stem remains a vibrant green, the outer edges show the changing of colors common during fall as it fades from a deep red at the edges to orange and yellow before melding into the green color. The obverse of 2019 1 oz Colorized Silver Maple Leaf features the right-profile portrait of Queen Elizabeth II. Her Majesty is depicted on the modern Silver Maple leaf in a fourth-generation depiction created in 2003 by Susanna Blunt. Please feel free to reach out to Silver.com with your questions. You can call us on the phone at 888-989-7223, chat with us live online, or simply send us an email with your inquiries.